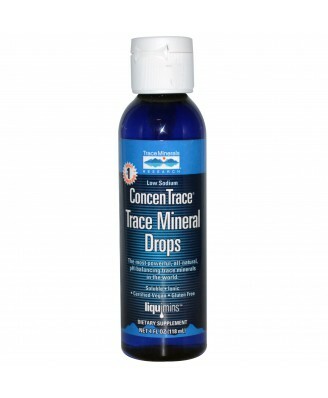 ConcenTrace Trace Mineral Drops is a natural mineral concentrate. Ionic sea minerals. Contains no other added ingredients. In addition to the elements listed above, this product contains the following in naturally occurring, varying trace amounts: Bromide, carbonate, calcium, silicon, nitrogen, selenium, phosphorus, iodide, chromium, manganese, titanium, rubidium, cobalt, copper, antimony, molybdenum, strontium, zinc, nickel, tungsten, germanium, scandium, vanadium, tellurium, tin, lanthanum, yttrium, silver, gallium bismuth, zirconium, cerium, cesium, gold, beryllium, hafnium, samarium, terbium, europium, gadolinium, dysprosium, thorium, holmium, lutetium, erbium, ytterbium, neodymium, praseodymium, niobium, tantalum, thallium, rhenium, indium and palladium, plus the other elements found in seawater. Certified vegan. 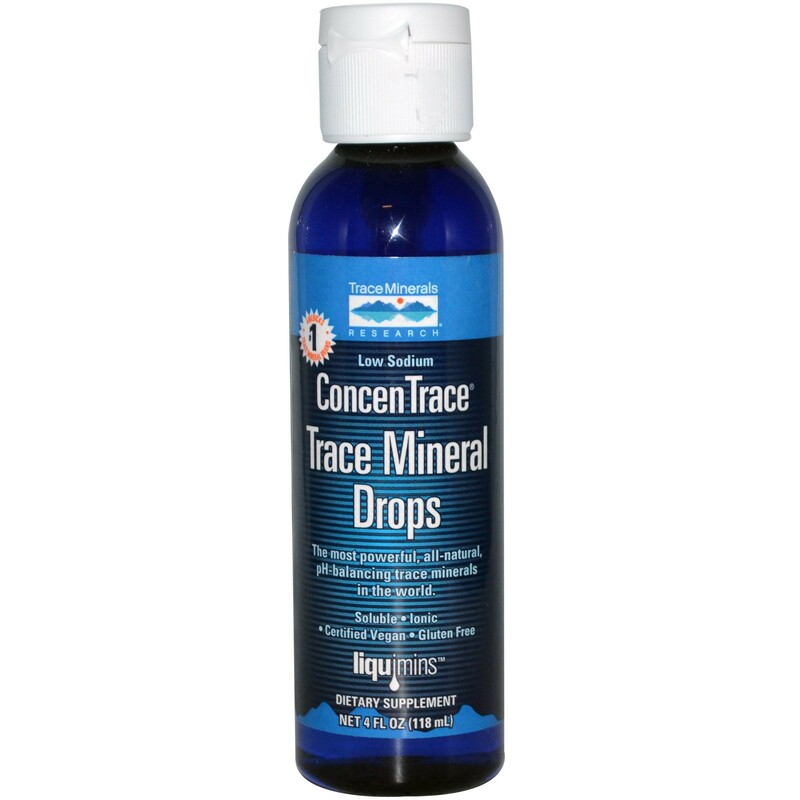 ConcenTrace Trace Mineral Drops is a natural mineral concentrate that is so concentrated that 40 drops (1/2 teaspoon) equals the mineral content of 1/2 cup sea water with 99% sodium removed. Begin regimen by taking 1/4 teaspoon (20 drops) for 3 consecutive days. Each day thereafter, increase dosage by 5 drops up to 1/2 teaspoon (40 drops) once or twice daily. Mix with any beverage or food at mealtimes to mask the concentrated mineral flavor followed by a glass of juice or water. Moderately increased dosages are safe if needed or desired, but larger amounts may cause a laxative effect. Remineralize water: Improve the flavor of distilled, reverse osmosis or purified water. Adding 20-40 drops per gallon or to taste (2-4 drops per glass) compares to expensive mineral water and adds a complete, balanced spectrum of low sodium minerals and trace minerals. 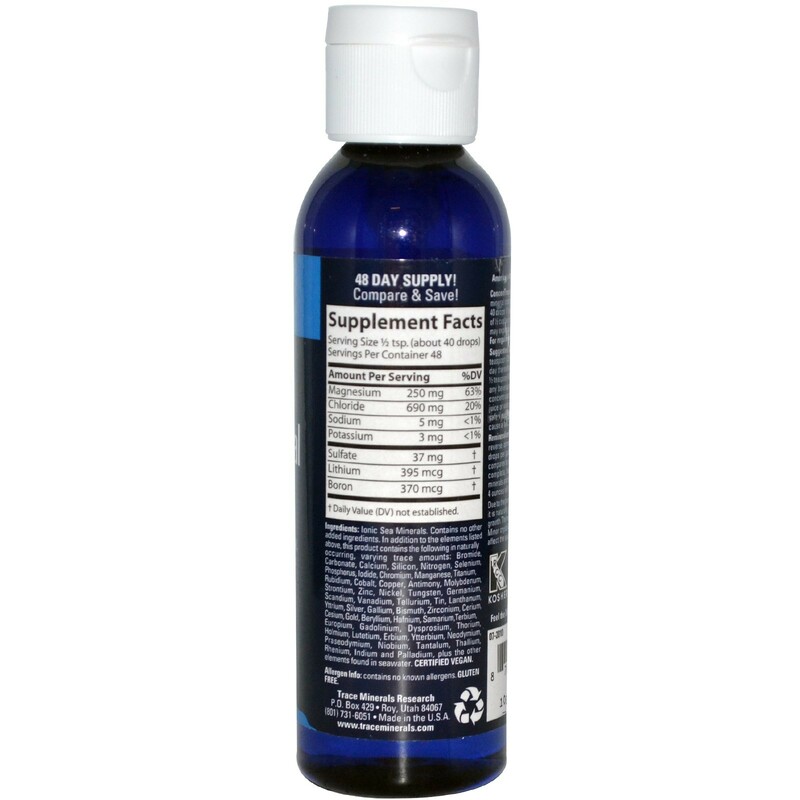 At 20 drops per gallon, 4 ounces will remineralize 96 gallons. Due to the purity and concentration of this product, it is naturally preserved and contains no bacterial growth. The minerals do not lose potency over time. Minor crystallization may occur, but this does not affect the quality of the product.